We are pleased to announce the opening of a new solo show at S Gallery (Sofitel Sukhumvit) in honor of Thai artist Pongsakul Chalao. Please join us for the opening on the 22nd of April, the opening ceremony will start at 6:00pm. Blue Jeans cocktails will be served during the event. Thai artist Pongsakul Chalao, 27, has been collecting jeans for ten years. They are cut and torn in pieces he uses to puzzle landscapes of his thoughts. Provoked by the socio-cultural scene of Bangkok and its surroundings, he mirrors these ideas through all possible hues and tones of denim. Bunditpatanasilpa Institute of Painting is where he studied, but fabric collage is a self-taught practice. Medium of both technique and concept, the blue piece of clothing, epitome of casual wear transcends all generations, cultures, styles and classes. The artist questions and reinvents the nature of the material. He considers the possible boundaries between abstraction and reality, notions of the East and the West, wealthy and impoverished. Pongsakul Chalao is tangled up in blue, a blue that once colored Joan Miró’s dreams. While listening to Bob Dylan, he intensifies the hues and contrasts of light and shadow, his sewing machine outlines and immortalizes the quest of an intangible landscape. A beauty found in the mundane, pictures that we come across every day but don’t always see. One that is accessible through symbols of globalization in a contemporary world, while juggling with conventions and expectations of what art should be, in a manner that is both subtle and wise. This exhibition presents his latest works, together with a sewing machine, his substitute for a paintbrush, and the denim, his color. 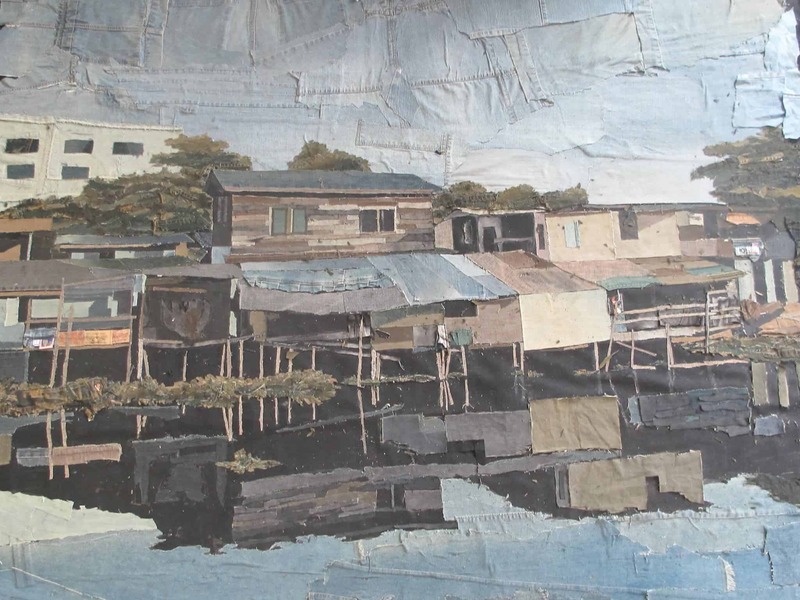 Pongsakul Chalao’s denim collages have previously been shown at the Art Center of Chulalongkorn University, V64 art studio and Brownstone Studios.